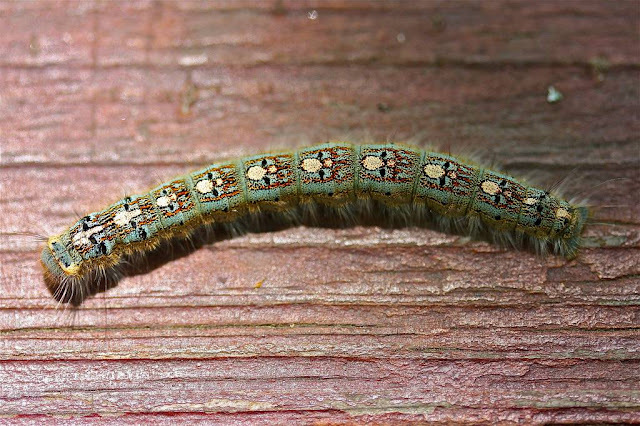 If you look at the caterpillar of the forest tent caterpillar moth (Malacosoma disstria) with a little imagination you can see something remarkable. 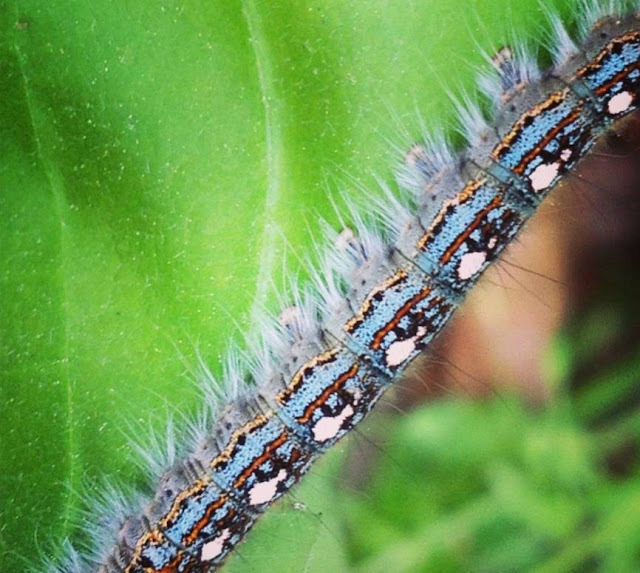 Found throughout North America, along the top of this caterpillar is ranged a set of what looks like dancing penguins. It looks as if his grandma knitted him a sweater for Christmas but decided that one motif simply wasn’t enough. 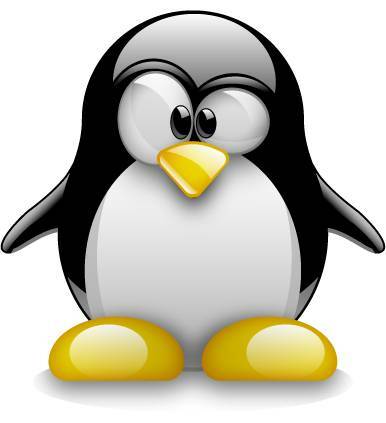 If you choice of operating system is Linux (probably the most prominent example of free and open-source software collaboration) then there might also be something familiar to this caterpillar – it bears a more than passing resemblance to Tux the Penguin, the mascot of Linux). You could say that this is the final proof that you need to show that the universe is simply a simulation run on Linux. Or maybe all those operating system experts were right all along – you can install Linux on anything. Humor aside, this, of course is one of nature’s inadvertent acts of mimicry. 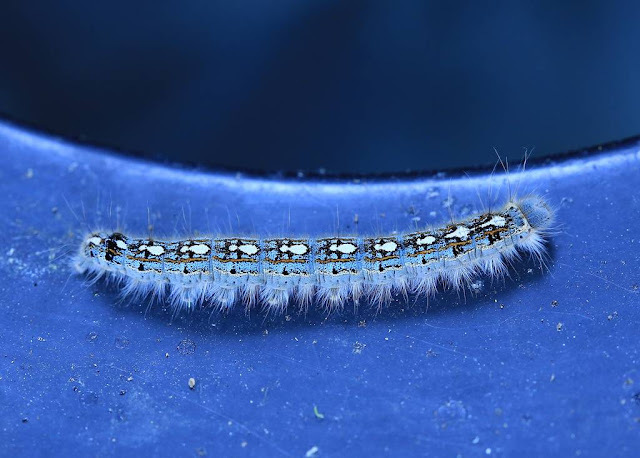 The fact that the patterns on the forest tent caterpillar look like penguins is sheer accident and cannot be classed as a form of antipredator adaptation. 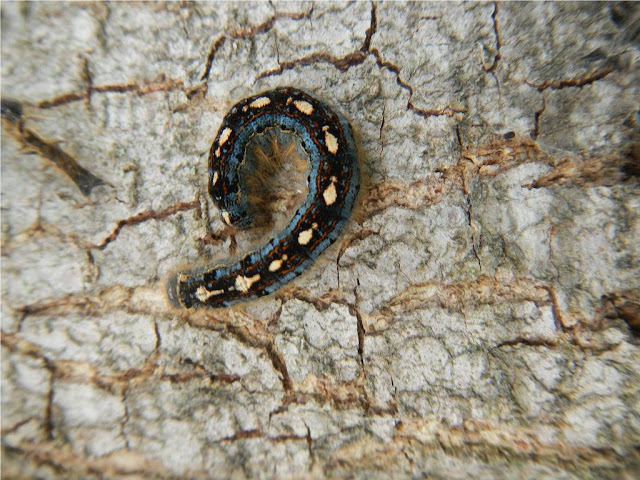 It is, however, a warning sign to predators that the caterpillar will not taste especially nice. Its penguin shape is coincidental but nevertheless entertaining and perhaps even charming to us. 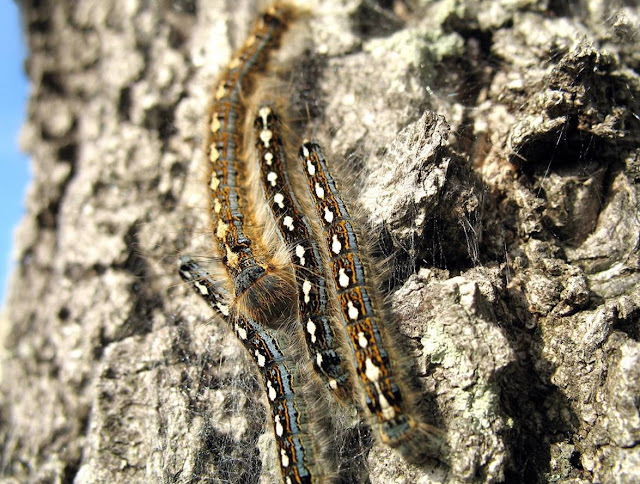 Less charming is the fact that every now and again these caterpillars will appear in such numbers that they become a threat to the maintenance of healthy populations of the trees it frequents, such as the oak, sweetgum, tupelo, aspen, and sugar maple. 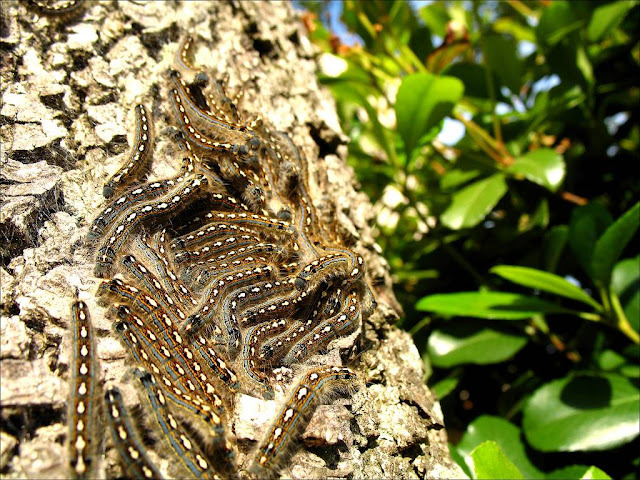 During these times of population explosion (no firm reason has ever been established) the caterpillars move en masse from the canopy to lower trees and the destruction they wreak can be almost Biblical in proportion. 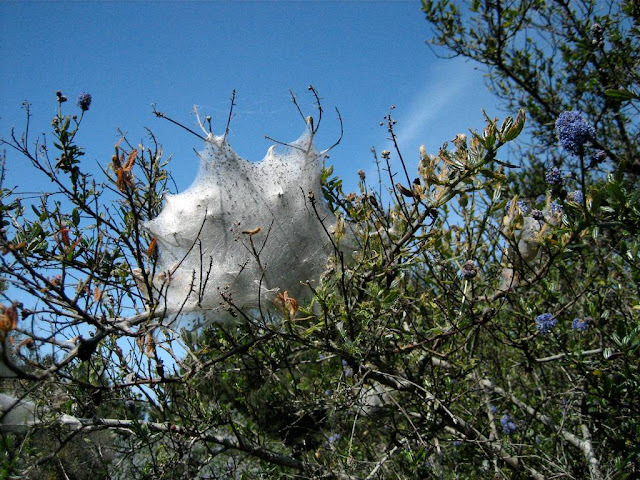 There are long traditions in farming communities that when tents are discovered (they are created when the caterpillars weave a silky sheet where they come together to molt) the solution has long been to destroy the entire formation with fire. 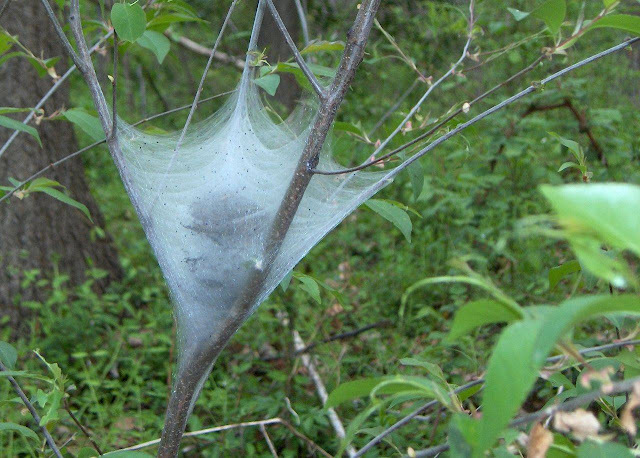 Although trees are rarely killed during a single ‘infestation’ if you have a single ‘tent’ one year you will most likely have more the next. When this happens over three or four years the trees can perish in significant numbers and many feel the need to intervene. 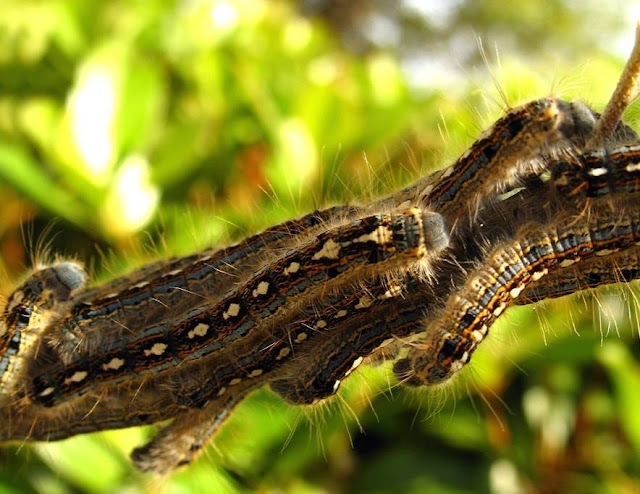 Yet this counter-attack by man is not a threat to the continuation of the species – the caterpilllars do not only choose farms when their population booms to what is called outbreak density. The outbreaks happen every decade or so. 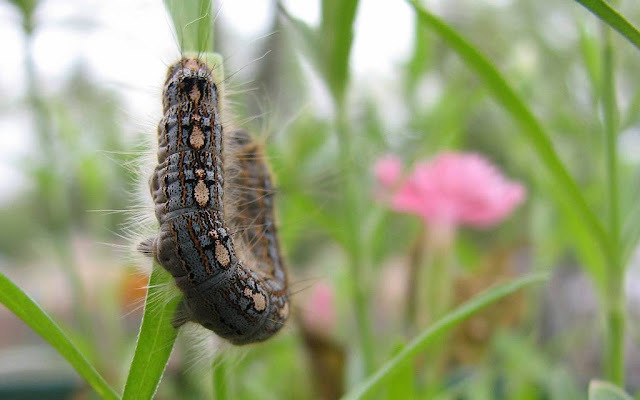 No one knows for sure why they happen but there could be a number of reasons for this population cycle. 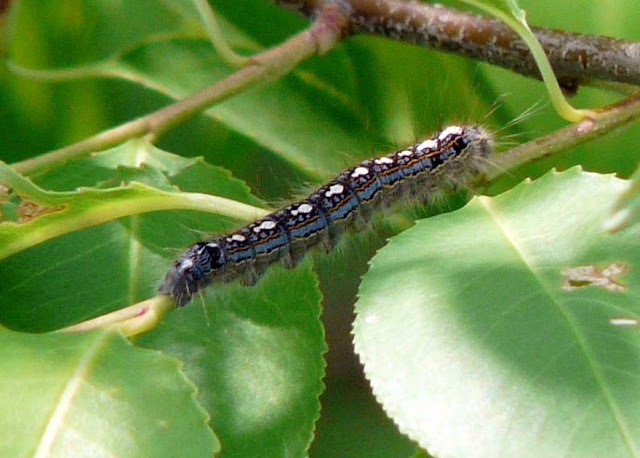 These reasons include a drop in the number of parasitoids which would usually consume a large proportion of the caterpillars. 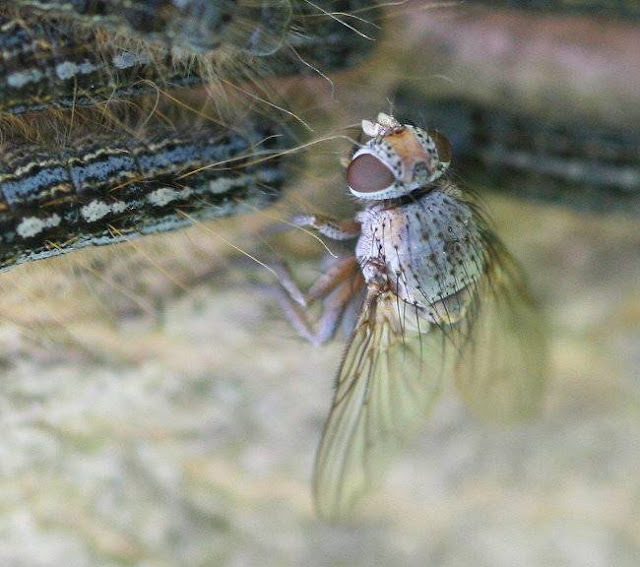 The tachina fly, for example, lays its eggs in to the caterpillars. 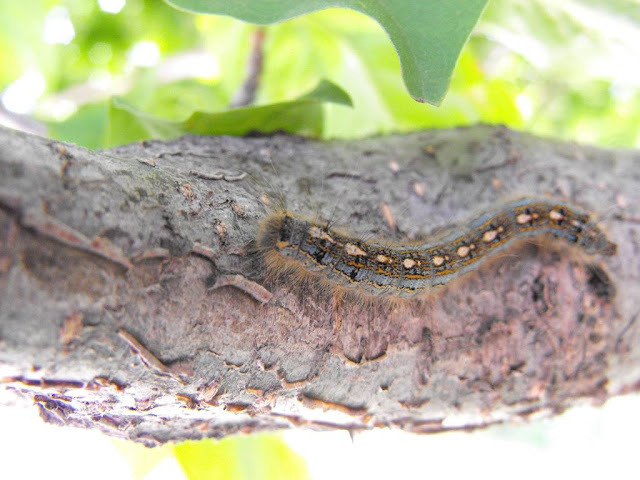 The larvae further bore in to the forest tent caterpillar and proceed to devour it from the inside out. When there are plenty of these flies around infestations tend not to happen and are often the main cause for their subsidence, rather than our intervention. 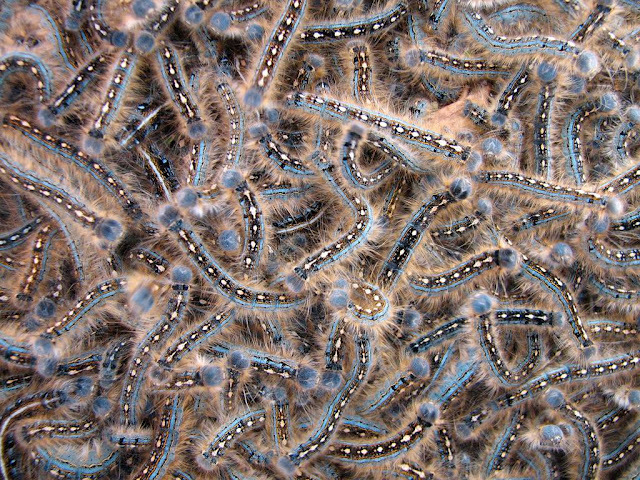 Yet let’s return to the patterns which first provoked this feature – the dancing penguins on the back of the forest tent caterpillar. From this magnificent start you might expect something equally fun at the other end of the metamorphosis (perhaps a Bambi or Dumbo motif). 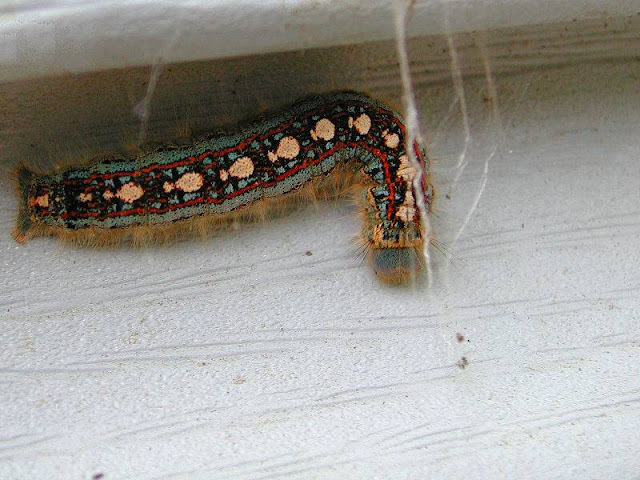 Unfortunately the forest tent caterpillar moth transforms in to something quite everyday. In the Hans Christian Anderson story the ugly duckling transforms in to a beautiful swan. 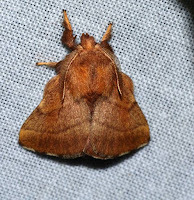 This moth does it the other way around. 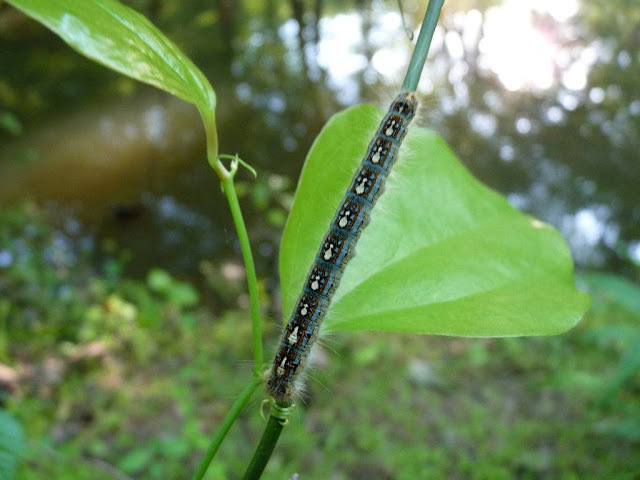 Yet for the short time it resides in its caterpillar form, you might say that penguins abound in the forests of North America.